OpendTect project with 3D and 2D Seismic Data, 3D and 2D Prestack Data, Stacking velocities, Wells, Markers, Horizons. License key protected parts of OpendTect (OpendTect Pro and the commercial plugins) can be used on this data set without license keys because the software does not check for license key when it runs on this data set. dGB Earth Sciences created the OpendTect project, computed dip-steering volumes and interpreted horizons. Cross QI created Conditioned PSTM angle gathers. M.Phil. research students Naveed Iqbal and Junaid Talha from Quaid-i-Azam University (Islamabad, Pakistan) digitized well logs. The data covers many geological features, which include graben bounded faults, channels, mega-scale de-watering faults, reefs, etc. The survey lies in the Scotian shelf (Figure-1), Offshore Canada. It contains several interpreted surfaces and two key wells. The survey contains several structural and stratigraphic features which can be highlighted by OpendTect attributes or advanced plugins. One main advantage of this survey is that it comes with a prestack dataset. You might also notice two major faults within the survey area that form en echelon pattern. These faults mostly displace the interpreted surfaces. Multi-trace similarity, volumetric amplitude or volumetric curvature maps could highlight these features. The seismic signal is poor below 3.0 seconds (about 5km). Only two wells, L-30 and B-41, were drilled in the area penetrating Misaine and Baccaro members of Jurassic Abenaki Formation (Figure-2). Several oil and gas fields are located in these Late Jurassic to Cretaceous intervals (http://www.cnsopb.ns.ca/php/cnsopb_assessment_reports.php). The Lower Logan Canyon sands in L-30 were considered oil bearing (minor accumulation). Some of the stratigraphic information is available also in OpendTect (please see the Manage Stratigraphy window in the OpendTect survey). However, the sub intervals of the Lower Logan formation are not mapped in OpendTect. The wells are available in the OpendTect survey, with markers and a time to depth model. The time to depth models have been taken from the CNSOPB report . The survey also contains a limited range of prestack data, which is listed in the Available Data section. Mandal, A. and Srivastava, E., 2017. Enhanced structural interpretation from 3D seismic data using hybrid attributes: New insights into fault visualization and displacement in Cretaceous formations of the Scotian Basin, offshore Nova Scotia. Marine and Petroleum Geology 89 (2018) 464 - 478. Qayyum, F., Catuneanu, O., Bouanga, C.E, Sequence stratigraphy of a mixed siliciclastic-carbonate setting, Scotian Shelf, Canada, SEG Interpretation Journal, Volume 3, Issue 2, p. SN21-SN37, May 2015. Kidston, A. G., Brwonl, D. E., Smith, B. M., and Altheim, B., 2005. 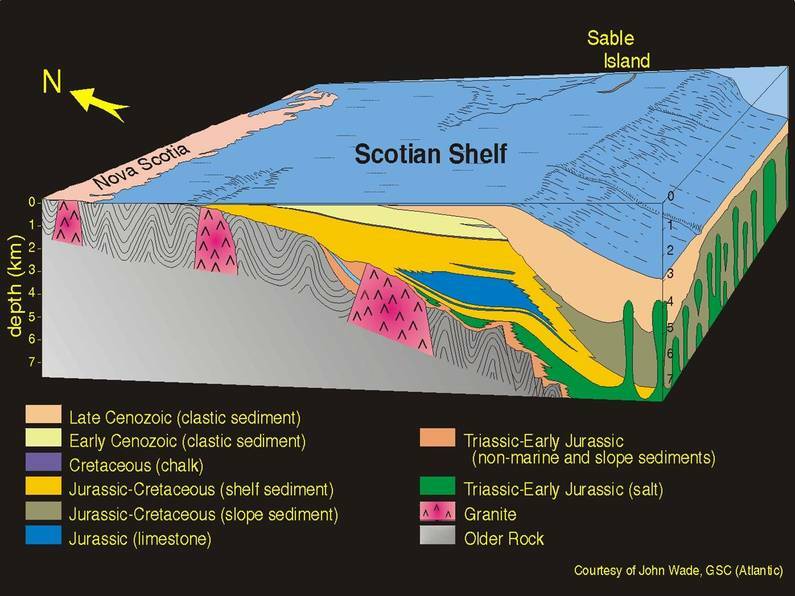 The Upper Jurassic Abenaki Formation, Offshore Nova Scotia: A Seismic and Geologic Perspective. Nova Scotia: Offshore Wells Overview Map. CNSOPB: Technical Summaries of of Scotian Shelf: Significant and Commercial Discoveries. Ammonite Nova Scotia Corporation weblink: More information on Penobscot and Eagle Structures. Qayyum, F., de Groot, P., and Hemstra, N., 2012. Using 3D Wheeler diagrams in seismic interpretation - the HorizonCube method. First Break, vol. 30, March, p. 103-109. 3D gathers pstm nmo; NMO migrated gathers; Total no. : 19280; Inline range: 128-1320 step 1; Crossline range: 1000 -1481 step 1; Mute definition: provided. 3A volume builder setup is saved and will provide the RMS velocity volume when run.